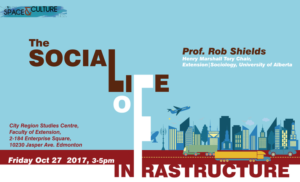 On October 27 Rob Shields presented asking, ‘What are the social effects of built infrastructure?’ Changing public interaction with civic infrastructure accumulates to changes in Canadian social forms. Infrastructure affects social integration, accessibility, and inclusiveness. Infrastructure choices affect the relations of core and periphery, and the exercise of sovereignty and Canadian values. 1. Infrastructure as representation of the system and program of the city? Infrastructure has often been believed to reflect how the city creates its system and manages natural resources. However, that is not necessarily the case. Sometimes infrastructure functions in a way that is not planned or expected. For example, we may find many built infrastructures such as bridges that were designed to provide a new passage over an obstacle or adjust the traffic flow/density. Instead, they are now being used mainly as venues for festivals, markets, or more stationary activities. In this sense, infrastructure may not necessarily be “broken” or “dysfunctional”, but it sometimes evolves or is re-purposed by the local residents to serve different or even multiple functions. Interestingly, we only acknowledge the existence of infrastructure when it is broken. For example, we do not always realize the significance of communication cables or pipes underground in our daily life but we only acknowledge their existence when they malfunction and thereby cause disaster, conflicts, and disconnections. This lack of acknowledgment is also partly attributed to the characteristic of infrastructure as public goods; the infrastructure is not owned privately and this lack of private possession makes it difficult for people to form personal attachment to it. Unlike built infrastructure, the non-physical and virtual infrastructure for organizing complex data and social relations—such as the internet and virtual archiving services of library—is hidden and seems to operate in a way that is gated. Thus, the access to virtualized systems can be often limited to certain groups of people, who know how to use and manage the data and resources. Built infrastructure hosts these virtual and non-physical services but by going beyond the physical limits of spatial capacity and resources virtual infrastructure extends meanings and functions of the physical. Therefore, both virtual and built infrastructure exists as different layers even if they are not tied closely together; the built infrastructure seems to function as exposed “surface” channel of the city, which may appear to be accessible compared to hidden virtual services. For instance, you may find it relatively easy to visit a civic library building while you need to have certain understanding of IT (information technology) to use virtualized data services provided from the library. Over the last decade, virtualization technologies have begun to dominate our interaction with different types of infrastructure. Despite the increasing importance of virtualized infrastructure, we still need built infrastructure to host those virtual services. More importantly, as Castells has argued, the built infrastructure will help the public form place-based identity and enhance citizens’ attachment to the city, regardless of its imposed functionality and effectiveness. Centralized and integrated approaches to infrastructure incorporate resource supplies and demand systems to achieve effective use of energy and resources. These approaches were also applied to many infrastructure renewal projects in “developing and underdeveloped” cities. In rebuilding infrastructure systems, mobility often plays a key role in materially and culturally reconnecting or disconnecting locations and services. More importantly, this role of mobility is further related to the issue of sustainability and quality of urban life. Bartling argues “Mobility defines the city as a circulatory site facilitating flows of capital, people, and information” and influences infrastructure to facilitate the city’s circulatory flows (2008: 100 and 102). Thus, the logic of mobility has often been considered to be a key determinant for the efficiency of infrastructure. However, focusing on the logic of mobility can repress the existing infrastructure, local knowledge, and social networks and replace them with a neoliberal idea of built environments. In this neoliberal approach, the built infrastructure is considered to be a main vehicle for promoting domestic industrial and economic growth by enhancing the cities’ image and creating an “effective” and “functional” business climate (Harvey, 1989; Wu, Li and Lin, 2016). The neoliberal ideology, which stems from the functionalism and rationalism of modernism, has embraced and developed the logic of mobility to bolster business activities and secure greater market freedom (Bartling, 2008: 100 and 102). For instance, lack of mobility and accessibility in “underdeveloped” areas was often considered a failure. This perception has reflected on infrastructure renewal projects of slums in third world cities (Anjaria, 2008: 199). It is often the case that these plans were proposed by international corporations or developers, who tend to follow “global standards” of enhanced mobility. Through these projects, developers expected to change the cities’ appearance of chaos and disorder, which may include dilapidated roads, traffic jams, and unruly crowds, creating organized urban environments with “better living conditions” (Anjaria, 2008). In this regard, the renewal projects seem to imply a tendency of equating the efficiency of infrastructure and mobility with the quality of urban life and sustainability. However, places which are spatially isolated and do not have proper transportation systems—such as cultural heritage, conservational, and slum areas—have their own communal support systems that have been evolving for many years based on their local networks. If we rebuild and outsource infrastructure in those cities focusing on the logic of mobility, the local urban fabrics will be organized and preserved in a shape that is only comprehensible for potential foreign investors as well as particular groups of local elites who know how to control the channels of movements in the city. To be specific, these infrastructure renewal projects in certain local areas have the potential to privatize public infrastructure by not only bestowing powers to sponsors who politically and financially supported the projects, but also privileging speed or particular modes of mobility that are accessible only for certain residents (Bartling, 2008: 101). To provide this privileged access to speed for certain residents, outsourced infrastructure systems slow down “unplanned” existing movements of other local groups and dismiss “the sophisticated system of production already contained” within the local context (Anjaria, 2008: 199; Wang and He, 2015: 25). In this sense, infrastructure renewal projects in developing and underdeveloped cities do not necessarily create sustainable urban life and environments responsive to local contexts. Instead, these projects could entail the dangers of “one-sided [top-down] civilizing” missions, which repress locality and replace it with neoliberal ideology. In pursuit of sustainability in cities, there has been a tendency to promote the “flexible, transformative, [and] liminal” character of infrastructure. These flexibilities of infrastructure are expected to connect socially and culturally disconnected groups and create an inclusive urban environment. We create this inclusive urban environment by pressing together, physically or virtually getting close and connected to each other. However, prior to this, we may first need preparatory engagement practices and appropriate education to get residents ready to connect with each other as well as society as a whole. Without proper understanding of our neighborhoods, positions of different social and cultural actors and existing urban fabrics, integrated urban infrastructure systems may aggravate conflicts, disconnection, and further intensify “exclusiveness” instead. In this sense, planning of built infrastructure (explained in the beginning) need to be accompanied by and integrated with non-physical communication infrastructure such as community engagement practices and education. David Harvey introduced the concept of the “right to the city” as a human right that changes ourselves by changing the city. He explained that we can reshape the processes of urbanization by exercising a collective power (Harvey, 2008: 315). This collective action is also concerned with the diversity and democracy in infrastructure planning and policy management by establishing more inclusive processes of decision-making and empowering the culture of marginalized groups (Rao, 2007: 90; Boucher, Grindsted, and Vicente, 2012: 11). In our striving for global and multicultural city status that tends to favor social and cultural diversity and sustainability, collaborative knowledge-building at the local level in public engagement is expected to play an essential role. The notion of public engagement in infrastructure developments has suffered from a lack of clear theoretical conceptualization. This is due to the problematic duality of two different social actor groups; cultural, financial, and political elites who are engaged in political decision making and have access to local and global markets, and the rest of the population living on the margins (Segbers, Raiser, and Volkmann, 2007: 344-345). This duality problematizes the notion of public engagement in the context of globalization and infrastructure development. Public engagement in pursuit of global and multicultural city status shows a built-in contradiction between grassroots level actions often associated with locality and top-down approaches in infrastructure management and city branding driven by decision makers and economic elites. For collaborative planning of infrastructure in multicultural societies, a conversation is necessary to bridge the gap between public engagement’s orientation to locality and the macro concept of globalization in global and multicultural city making strategies of municipalities. Anjaria, J. S. (2008). On Street Life and Urban Disasters: Lessons from the ‘Third World’.” In Phil Steinberg and Rob Shields (ed.). What is a City? : Rethinking the urban after Hurricane Katrina. Athens, GA: University of Georgia Press, 186-202. Bartling, H. (2008). Mobility and the Regional Context of Urban Disaster. In Phil Steinberg and Rob Shields (ed.). What is a City? : Rethinking the urban after Hurricane Katrina. Athens, GA: University of Georgia Press, 99-111. Castells, M. (1999). “Grassrooting the Space of Flows”. Urban Geography, 20(4), 294–302. Corsin Jimenez, A. (2014). The Right to Infrastructure: A Prototype for Open Source Urbanism. Environment and Planning D-Society & Space, 32(2): 342-362. Harvey, D. (2009). The Right to the City. In David Harvey, Social Justice and the City. (revised ed.). Athens and London: University of Georgia Press, 315-332. Wang, D. and He, S. (Eds.) (2016). Mobility, Sociability and Well-being of Urban Living. Berlin: Springer. Wu, Y. et al. (2016). Reproducing the City of the Spectacle: Mega-events, Local debts, and Infrastructure-led Urbanization in China. Cities, 53: 51–60.